Rather than relying on one single, simple functional test, WORLD electronics can offer In-Circuit Testing (ICT) of most PCB assemblies. ICT can be one of the most efficient and most effective tests for the PCBAs. In-circuit testing is yet another of the many methods of testing undertaken by WORLD. PCB ICT is an example of testing wherein each individual PCB is checked for shorts, opens and functionality. ICT is one of the oldest forms of PCB testing and is most suitable for larger volume and stable designs. WORLD can perform a wide variety of tests on all its products, including ICT and functional testing, to maintain quality control. In the majority of production runs, WORLD utilizes every method of testing available in order to dramatically cut down on failures. The most common method of in-circuit testing utilizes the bed of nails test. This is one of the very oldest processes whereby a PCB can be tested for opens, shorts and functionality. In this test, each PCB undergoes analysis with an array of spring-loaded pogo pins, each of which was placed on the fixture according to the layout of the PCB that it is designed to test. Any faults can be quickly pinpointed and the PCB either reworked or scrapped if necessary. These pins contact test points around the PCB, contacting hundreds or even thousands of nodes within the circuit board. This is done by using a small vacuum, which pulls the device down onto the PCB. The bed of nails fixture can be used in conjunction with a device which checks each node manually, although this predictably takes far longer. ICT identifies whether the correct resistance and capacitance are observed within each component of the PCB. ICT fixtures are implemented and supported during electronic circuit board manufacturing, and can be utilized anywhere from initial solder application to a final check before full assembly. Each stage is monitored by an in-house computer, which compares each PCB to the expected schematic. 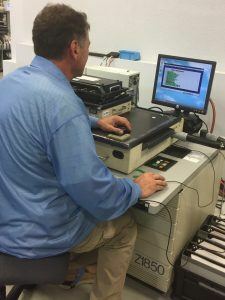 In-circuit testing is more comprehensive and demands more resources than functional testing, but this ultimately results in a better tested and more reliable product. What are the benefits of in-circuit testing? An in-circuit test is one of the most effective tools in detection of electronic component placement errors, solder defects, and many other possible fault conditions that may occur during circuit board manufacturing. Through this form of testing, it is possible to account for manufacturing faults before assembly of the finished product, unlike functional testing, which can only take place once the product is fully assembled and ought to function as intended. ICT is therefore essential throughout the production process and results in fewer failures during the functional testing stage. WORLD works with our customers to define the design criteria and fault coverage requirements appropriate for each assembly. This is because if a product has not been designed for testing, it can be difficult or impossible to comprehensively check at the end of the manufacturing process. As such, WORLD ensures that each PCB it produces can be safely and thoroughly tested, ensuring that each product receives a bespoke and thorough analysis. Whether it's about a job we have in-house or an idea you've been thinking about, you can send us questions or comments at any time of the day or night. © Copyright WORLD electronics Sales and Service, Inc. 2019. All Rights Reserved.